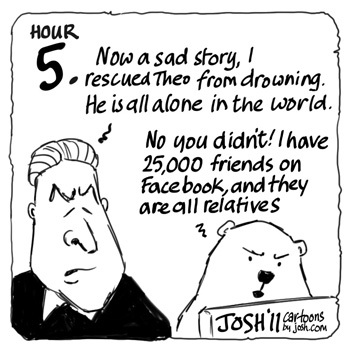 24 Hours of Climate Reality: Gore-a-thon – Hour 5 | Watts Up With That? 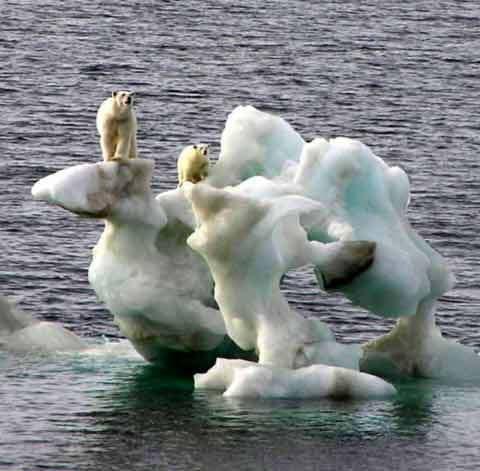 The level of ridiculae surrounding the polar bear “plight” was kicked off by that master of disaster Al Gore, with his swimming, drowning, polar bear animated characterization in “An Inconvenient Truth”. See it below about halfway in. Astute readers may recall seeing a photo flashed around the world earlier this year of polar bears “stranded” on an ice cube at sea. Please follow this link to the original photographer. See the bottom right photo. I would like to thank Josh and Anthony for providing new and interesting material for each hour. This is in stark contrast to the “Al Gore Variety Hour” which is repeating the same presentation hour after hour for 24 hours (just with different speakers). I have posted this link quite a few times on comment boards (like yours) in response to someone indicating that the climate models are good or that there is no fraud in climate science. I wrote it on 28 November 2009 after I had a gone through all the code and data available in the ClimateGate FOIA file. It is still getting hit daily. I never thought it could reach more than a few thousand people, I guess it caught on. I was (and still am) upset by the perversion of science exposed by the release of the information so I tried to use humor to communicate what I saw as the central message of the scandal. They lie and they know that they lie, and now we know it too. I will not be satisfied until all of the papers that directly or indirectly cite the fraudulent activities of the CRU have been withdrawn and buried. PS. Much truth is spoken in jest. By the time it’s over, you’ll be qualified to present it on your own! The Woods Hole Link above is broken. 404 error…. Anthony, I fear for your sanity. gore is lying on BBC on NPR, now. the brits seem terribly concerned they may not get to help pillage the usa through a carbon ‘market’. he gets a cushy platform to preach his poison. a certain university gets a mention..
A certain university gets a mention. anyone else think the twitter feed is fake? Nice to have Elmer’s videos on board. I believe they are still issuing permits for 400-500 P bears to be taken by hunters annually . Despite all the bears that have been taken by hunters over the years, as Anthony points out above, there are still enough of them that they constitute a growing hazard to human populations in Canada. Hardly seems like the symptoms of a species that is in decline or threatened. Given the very large territories that individual bears lay claim to, has anyone ever calculated how large the population of bears can grow before we start to see increasing numbers of bears dying in battles over territory? 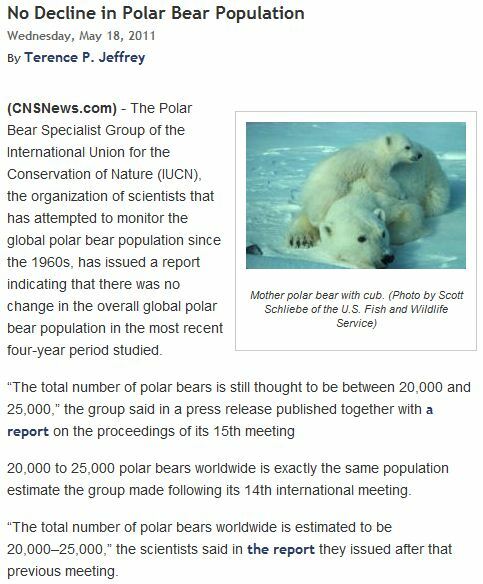 You know what the irony is the biggest threat to polar bear cubs is … polar bears . These guys don’t play nice an adult male will kill and eat cubs if they get a chance . So if you want save little cute polar bears from their biggest threat you know what you have to do. This cartoon is the best so far. Speaking of Poley Bears, remember this? Alarmist videos will (or should) go down in history as being some of the most offensive, as well as idiotic of all time. Unfortunately for them, they backfired.